If you have ever wanted to take a vacation and relax in the sunshine with all of your expensive paid but didn’t have the vacation time you can live vicariously by playing the Tipsy tourist 3D video slot game for real money. BetSoft online casino gaming software powers this 5 reel, 20 payline 3D video slot machine that you can play online or on the go with your tablet or mobile Smartphone. If you live in the United States of America (except the states of New Jersey, Delaware and Nevada) you can play the Tipsy Tourist at any of the best online casinos for slots that are listed below or take a look at the US Bitcoin casino sites section. Before you start playing “The Tipsy Tourist” online slots for real money you have the chance to watch the introduction that features the same 3D eye-popping graphics that BetSoft is notorious for. 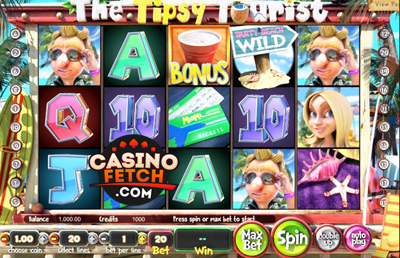 The introduction tells you about the game and the story line but you can choose to click on the skip button if you want to start playing The Tipsy Tourist online slots for real money right away. The main character in The Tipsy Tourist is on vacation in Miami. He is having fun by drinking, relaxing, meeting beautiful women and playing poker for real money with friends and he may even win some extra money while having fun. If you want to read other BetSoft online casino slot game ratings take a look at the Mr. Vegas online slots game reviews section. Once you have finished watching the introduction you will select the amount of money that you want to bet. You can play The Tipsy Tourist online slots game for real money with as little as two pennies and as much as one dollar per payline. $100 is the maximum amount of money that you can bet when play with five coins per payline that cost one dollar each and play all of the twenty paylines. While enjoying playing the Tipsy Tourist you can win some great prizes like the free spins bonus game, the wild symbols that will increase your profits, and the drinking bonus. When you are spinning the reels playing this BetSoft slot machine you will see symbols that are indicative of a tipsy tourist that is on vacation in Miami. You will see blue skies, surfboards, beautiful women, palm trees, white sand and other vacation themed symbols.